Amazon.com has introduced its Appstore last week and if there is one thing that makes this service better than the iTunes App Store, it is the Test Drive feature. 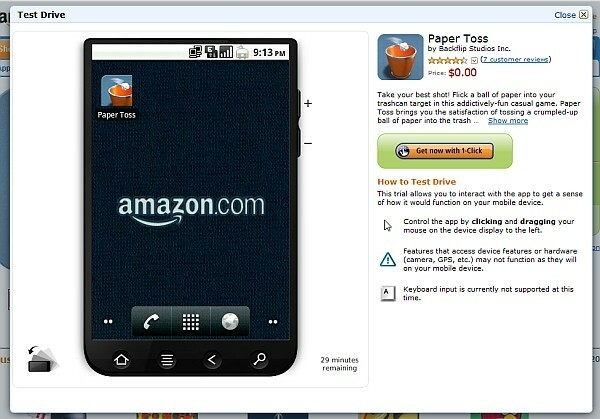 It allows customers based in the United States test the apps on Amazon.com straight from the browser, showing a Flash-based mockup of the app, giving them an idea what the app is about and decide whether it is worth installing. The Test Drive is displayed on what looks like screenshots of the app, but are actually virtual Android smartphones users can test the apps with, as well as browse through the phone’s photo gallery, listen to the music playlist, and even surf the mobile web. You can try the Test Drive on Amazon.com.